of suitable magneto-plasmonic nanostructures for applications in medical diagnostics, therapeutics, and biological imaging. Plasmonic and magnetic nanoparticles (NPs) are under investigations towards their potential use in biomedical applications. Gold is mostly used as noble material in biomedical applications because of its biocompatibility, resistance to oxidation, synthesis routes and flexible conjugation possibilities with organic molecules . The magnetic nanoparticles (MNPs) are used in biomedical applications because of their high magnetic susceptibilities with very low toxicity and to be used as magnetic drug targeting agents, magnetic resonance imaging contrast agents and for magnetic separation [2,3]. Nanoparticles exhibiting localized surface plasmon resonance (LSPR) due to collective oscillations of free conduction electrons and showing the strong optical resonance for visible and near-infrared wavelengths are called plasmonic NPs (e.g. silver and gold) . Plasmon resonances endow the unique optical properties such as strongly enhanced absorption and scattering at plasmon resonance wavelength. The absorption peak in near-infrared (NIR) region and superior scattering is suitable for optical based biomedical applications. The intensity or efficiency and position of resonance peak is highly size, shape and surrounding medium depended. The magneto-plasmonic nanostructures are integrated the magnetic and plasmonic nanoparticles and their optical properties can be studied using electrodynamics methods. Kelly et al. studied the optical properties of metal nanoparticles with the influence of shape, size and dielectric environment  but to our best knowledge studies related to magneto-plasmonic alloy nanoparticles are limited. In this work, the optical properties such as λmax, absorption efficiency, FWHM, Qscat /Qabs factor at λmax of Au-Fe nanoparticles with their triangular shape are calculated. The influence of size, composition and surrounding medium for triangular shape nanostructure are investigated. These finding can help towards the use of new design and suitable magneto-plasmonic nanostructures in photothermal therapy and imaging. DDA (discrete dipole approximation) is one of the powerful and useful electrodynamics methods to calculate the extinction, scattering, and absorption of EM plane wave by isolated targets of arbitrary shapes, compositions and external medium. The absorption efficiency (Qabs) as a function of wavelength is calculated using DDA method. The present calculations of bimetallic alloy for triangular shape are performed by using DDSCAT 7.3, given by Draine and Flatau . In all calculations, the number of dipoles is taken nearly ~8×104 to represent the target and its effective size is calculated as aeff = (3V/4π)1/3. The various dielectric functions are being included to calculate the optical properties of nanomaterials. Values of dielectric constant for gold and iron as a function of wavelength are taken from John and Christy [7,8] and then weight percentage method is used to calculate the values of dielectric constants of alloys. All the DDA calculations are made for three different refractive indexes of the medium (n = 1.00-air, n = 1.33-water, and n = 1.53-silica) as many environments (representing different refractive indices) are encountered in biomedical applications. From the calculated spectra of Qabs, the optical characteristics such as λmax, efficiency factor and (full width half maximum) FWHM are obtained. In addition, we also calculate the Qscat /Qabs at λmax, which is an important parameter for the foreseen application. Optical properties of metallic nanostructures are described on the basis of complex dielectric constants as a function of wavelength. The size of nanostructures are varied from 30 nm to 70 nm, which is greater than the free mean path of conduction free electrons, so, surface scattering effects are not important and hence, no size corrections are included in dielectric constants. The real part of the metal-dielectric function determines the LSPR peak position and imaginary part determines the relative contribution of scattering and absorption. Thus, obtained effective real and imaginary parts of dielectric constant values for Au1-xFex (x = 0.25, 0.50 and 0.75) along with individual metals are shown in FIG. 1(a, b). FIG. 1. TGA-DSC Curves of As-product CuO doped ZnO nanocomopsite as recorded at a constant heating rate of 10 °C/min. When we combine individual metals to form alloys, the variations in dielectric constant values are responsible to change in optical properties of alloy NPs in comparison to individual metals. The dielectric function of the bimetallic alloy is calculated by average weight method, given as εalloy (ω) = (1-x) εAu(ω)+(x)εFe(ω), x represents the metal composition in Au-Fe nanoparticles. Thus, optical properties are calculated for x = 0.50 in alloy metal composition. FIG. 2. shows the calculated absorption spectra of Au50Fe50 bimetallic alloy nanoparticle for triangular shape with different sizes. As the size of nanoparticles increases, the LSPR or λmax shows the increase in peak position with redshift along with an increase in absorption efficiency. With increasing size, the peak lies between 270-626 nm wavelengths. There is two LSPR peaks are observed for 30 nm to 50 nm in absorption spectra. With 30 nm particle size, the peaks are shifted to longer wavelength; peaks 1 and peak 2 are located at 273 nm and 529 nm wavelength respectively. The magnitude of peak 1 is much larger than 2, and as a result, peak 1 is dominant whereas peak 2 looks like a shoulder of peak 1. These two peaks are dipole resonance mode and the similar trend has been noticed by Zhou et al. for cube shape nanoparticles . For 50 nm particle, two peaks (1 and 2) are observed at wavelength 400 nm and 575 nm respectively, and they have the almost same magnitude. The reason is the aggregation of nanoparticles. For 70 nm particle size, a broader peak appeared at 626 nm wavelength. However, there is another parameter i.e., the sharpness of edges of triangular nanostructure which show large LSPR width and broad peak. This kind of edge effect has been seen by Mock et al. for triangular shape silver nanoparticles . Furthermore, the optical properties of the considered alloy can be tuned anywhere on (electromagnetic) EM spectrum with a change in composition (not considered here) for each considered particle size. Furthermore, gradually increase in LSPR wavelength with size is shown in FIG 3(a, b). The absorption efficiency is also increased with a refractive index of the medium, particularly for n = 1.33 and n = 1.53 more effective. This behavior is due to the oscillation of conduction band electrons over the large distance which results in the smaller restoring force. Therefore, LSPR peak shifts towards the longer wavelength region. FIG. 2. 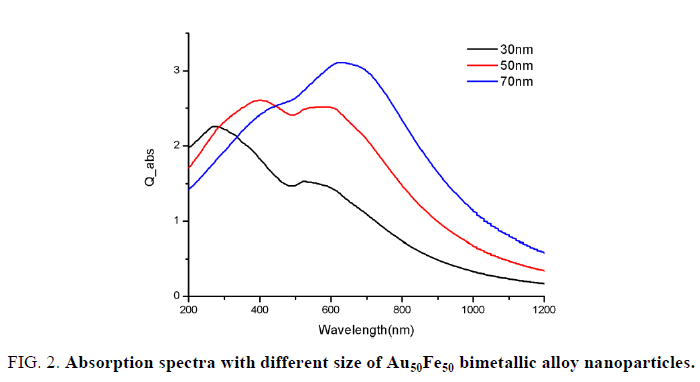 Absorption spectra with different size of Au50Fe50 bimetallic alloy nanoparticles. FIG. 3. (a) Effect of the medium refractive index on LSPR wavelength (b) absorption efficiency as a function of particles size. Moreover, the LSPR peak shifts towards the higher wavelength regions (301 nm, 402 nm, 625 nm for 50 nm particle size) by changing the surrounding medium for a fixed size of nanoparticles. This is due to the decrease of the frequency of free electrons oscillations with increasing refractive index. FIG. 4 shows the full-width half maximum (FWHM) as a function of size with changing surrounding medium. Since, FWHM aid their use in particular applications, for example, larger FWHM with enhanced scattering efficiency is used in plasmonic solar cells to increase the absorption efficiency and lower FWHM in sensing applications. The calculated FWHM is strongly enhanced (i.e., 115 nm to 388 nm for n = 1.00, 197 nm to 523 nm for n = 1.33, and 260 nm to 568 nm for n = 1.53) medium refractive index and thus, covers a large region on EM spectrum. For n = 1.00, the FWHM is gradually increased in comparison to other considered refractive indices. With the increase in size up to 50 nm, the FWHM increases due to increase in imaginary part in the wavelength region of 200 nm to 550 nm and FWHM decreases for above the 50 nm particle size due to a decrease in imaginary part as shown in 1(b). All over, FWHM increases with increase in refractive index of surrounding medium. FIG. 4. Effect of the medium refractive index on FWHM of Au-Fe nanoparticles. FIG. 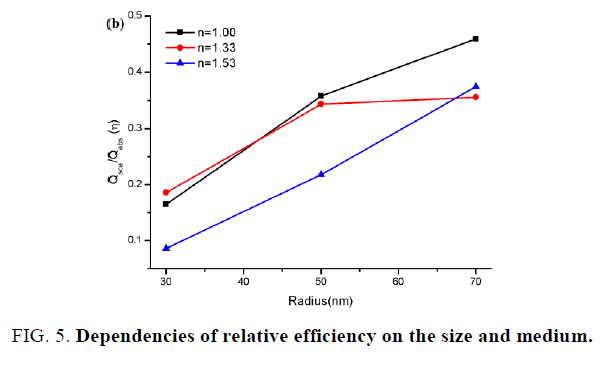 5. shows the size dependent relative efficiency of Au-Fe alloy nanoparticles for different surrounding media. The relative efficiency continuously increases for n = 1.00 and n = 1.53 in comparison to n = 1.33. This increase in the ratio of scattering to absorption with the nanoparticles size suggest that the larger nanoparticles would be more suitable for biological imaging applications based on light scattering. FIG. 5. Dependencies of relative efficiency on the size and medium. It has been found that the triangular shaped nanostructure exhibit enhanced plasmonic properties for suitable particle size and the surrounding medium. The increase in size resulted in shift of localized surface plasmon resonance (LSPR) from ultra-violet (UV) visible to near-infrared (NIR) regions and enhancement in absorption efficiency parameters. The influence of size, composition and surrounding medium on considered nanostructure are investigated. And the findings can help towards the use of new design and suitable magneto-plasmonic nanostructures in photothermal therapy and imaging. The effect of size on full width half maximum (FWHM) has also been analyzed. The comparison of triangular shape nanostructure for different surrounding media shows that the LSPR λmax and FWHM have the ordering for the refractive index of n = 1.53 > n = 1.33 > n = 1.00. Thus, the presented results can help in the selection of suitable magneto-plasmonic nanostructures for applications in medical diagnostics, therapeutics and biological imaging. Cobley CM, Chen J, Cho EC, et al. Gold nanostructures: a class of multifunctional materials for biomedical applications. Chem Soc Rev. 2011;40:44-56. Liao Z, Wang H, Lv R, et al. Polymeric liposomes-coated superparamagnetic iron oxide nanoparticles as contrast agent for targeted magnetic resonance imaging of cancer cells. Langmuir. 2011;27:3100-5. Alexiou C, Tietze R, Schreiber E, et al. Cancer therapy with drug loaded magnetic nanoparticles-magnetic drug targeting. J Magn Magn Mater. 2011;323:1404-7. Maier SA. Plasmonics: fundamentals and applications. SSBM. 2007. Kelly KL, Coronado E, Zhao LL, et al. The optical properties of metal nanoparticles: the influence of size, shape, and dielectric environment). J Phys Chem B. 2003;107:668-77. Draine BT, Flatau PJ. Discrete-dipole approximation for scattering calculations. JOSAA. 1994;11:1491-9. Johnson PB, Christy RW. Optical constants of the noble metals. Physical review B. 1972;6:4370. Johnson PB, Christy RW. Optical constants of transition metals: Ti, v, cr, mn, fe, co, ni, and pd. Phys Rev B. 1974;9:5056. Zhou F, Li ZY, Liu Y, et al. Quantitative analysis of dipole and quadrupole excitation in the surface plasmon resonance of metal nanoparticles. J Phys Chem C. 2008;112:20233-40. Mock JJ, Barbic M, Smith DR, et al. Shape effects in plasmon resonance of individual colloidal silver nanoparticles. J Chem Phys. 2002;116:6755-9.